Mes chers, of course we learned our ABC’s as tiny tots toddling through the corridors of our humble childhood abodes in our mother’s castoff high heels; but the time has come to learn a different form of ABC’s – those of personal style. And now one (1) of you glamorous gals will be receiving precisely that from ELLE magazine’s beloved Style Guru…Mr. 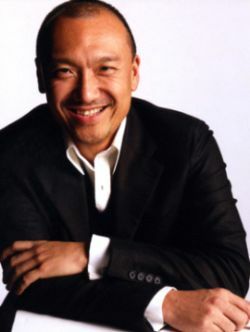 Joe Zee! 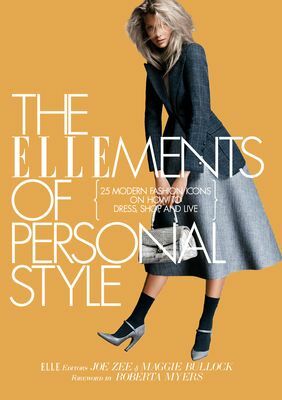 Today is your lucky day, lovers; Café Fashionista has teamed up with Penguin Group to bring one (1) of you fashionable femme fatales a copy of the recently released The ELLEments of Personal Style: 25 Modern Fashion Icons on How to Dress, Shop, and Live. Chock full of hundreds of tips from stylistas such as Fergie, Candace Bushnell, Christina Hendricks, Erin Wasson, and Diane von Furstenberg, in addition to full-color photographs of celebrity closets, homes, and inspirations; The ELLEments of Personal Style is like an all-access pass to the lifestyles of the fierce, fabulous, and stylish – and soon it may be yours! ♥ For one (1) entry, leave a comment on this post stating what modern fashion icon you would love to receive style tips from between now and Friday, November 12, 2010 at midnight PST. ♥ For two (2) entries, Twitter about this giveaway, and leave a comment on this post stating what modern fashion icon you would love to receive style tips from between now and Friday, November 12, 2010 at midnight PST with your Twitter URL. ♥ For three (3) entries, become a follower of Café Fashionista on Blogger/Google Reader/Google Friend Connect/Twitter, and leave a comment on this post stating what modern fashion icon you would love to receive style tips from between now and Friday, November 12, 2010 at midnight PST (if you are already a Café Fashionista follower, please say so in your comment). I will randomly pick one (1) name out of a hat (who knows, it could be yours! ), and announce the winner on Saturday, November 13, 2010. Thanks to Penguin Group and TV Fanatic for the pictures. Love Vera Wang. Her designs are so ethereal and pretty. Great giveaway! I want Zooey Deschanel's tips! Charlotte Gainsbourg. I love her style and it seems so approachable. Maybe b/c she always has messy hair and I, too, always have messy hair. Just not hair that's as artfully messy as Charlotte's. And now I'm a follower. Not just b/c I really, really want this book! Awesome- I'd love tips from Heidi Klum or Diane Kruger. Believe it or not, I would love to get tips from Jennier Aniston! Love her classic, "All-American" wardrobe! I'm a follower on Google Connect and on Twitter! I follow on Google Connect and Twitter. I would love to receive style tips from Kim Kardashian. She's always so fashionably dressed despite having a super curvy figure just like me !! hmm...I like Emma Stone's style and Evan Rachel Wood. I would love to have a bit of their sass. Great giveaway, love! I follow both here and on Twitter. I've missed you so much...I'm hoping to be completely back to the blogging world very soon. But guess what?! I'm officially living in NYC now! Aaaahh! Speaking of, did you see my guest post from Designing Majorie on NYC Coffee shops?! You would love it! I love watching Project Runway and Tim Gunn is always so sweet yet makes great critiques. I'd like his help in revamping my style, elegant yet fashion-forward? Sounds like a good book! I would love to get style tips from Olivia Palermo. She always looks amazing! I am a follower of your blog through gfc . OH WOW..what a wonderful giveaway. Sounds so fun. Would love fashion tips from Rachel Bilson! I would love to have a sit down with Stacy London. I enjoy her style and her humor! I would love to get style tips from Miss Rachel Bilson; that girl can do nothing wrong style-wise! I follow on twitter an google friend connect! Stacy London would tell me to get a pointed toe heel, dark denim jeans, and a blazer (which has become my go to ensemble). I think I'd love to get style advice from Princess Diana, were she alive because 80% of the picture of her from 1993 until she died are all things I'd wear. I have a couple of style favorites, but I don't think there's anyone else that I'd want advice from. Although, if someone else were willing to buy the things they suggested, I'd love advice from Victoria Beckham. Hands down, no competition, I'd want Tim Gunn's advice! He's very good at giving the advice, yet sounding perfectly nice at the same time! Plus, I love love LOVE his sense of style! Hope everyone (including you of course, Erica) has an amazing halloween! I love Joe, his A to Z column is my favorite! I'm most definitely a follower and would love to receive style tips from Alexa Chung...I love her look. Such a sweet giveaway - upon reflection I don't think there's any one person that I'd welcome 'Fashion' advise from. Awww, Id love to win this book! I would like to receive tips from Sienna Miller, she is so lovely! I´m your follower on GFC! another great giveaway...and I would say Sarah Jessica Parker would be my pick...have a great weekend!! just tweeted your giveaway as well !! i'm loving this giveaway... hope i get to win! I would love to get style advice from Rachel Bilson. I follow on twitter. Hmm, I'd be interested in style advice from one of the grand wizards of fashion, Mr. Armani himself. Great contest, Erika! Amazing giveaway! I subscribe to Cafe Fashionista on my Google Reader. I would love to receive style tips from Kate Lanphear...her style is FIERCE! Such an awesome giveaway! I've been eying this book for some time now. The fashion icon I would love to receive style tips from would have to be Victoria Beckham. She personifies glamor and femininity, and has fun with her clothes. P.S. I'm an avid follower of your blog! I would really really love to get style tips from Kate Moss or Sienna Miller! I love their style. I woul love lover love to get styling tips from Chiara of The blonde salad,I just love her style. Count me in, I love style books! Rachel Bilson. she always looks put together and classy. Zooey Deschanel! she always looks so put together in a laid back way! zooey deschanel or rachel zoe! Oh my gosh I have so been desiring this book!! GREAT giveaway! I would love to spend a day with Rachel Bilson talking fashion! She always looks so great. Zooey Deschanel is my style icon. I often think: what would Zooey wear? I love Joe - what a great giveaway. i would love to receive style tips from Mr. Joe Zee himself! !